The Wharton Certificate of Professional Development (CPD) offers you an opportunity to specialize in your area of expertise, further increasing your professional value and maximizing your impact on your organization. With so many organizations facing change, strong leadership skills are always in high demand. This track will give you the abilities you need to influence, inspire, and lead your organization through any challenge. Becoming a Leader of Leaders: Pathways for Success — Ensure your competence as a leader and examine the timeliness of your strategic vision. Senior executives learn from the decision-making processes of great leaders and discuss challenges with a network of global peers. Creating and Leading High-Performing Teams — Develop your ability to build, effectively lead, and successfully sustain high-performance teams. Explore team dynamics in the classroom — using the latest research and casework — and in highly experiential exercises. High-Potential Leaders: Accelerating Your Impact — Develop the strategic perspective required of global leaders, learn to manage uncertainty and execute your vision, and establish a firm personal foundation that can withstand the pressures of leadership. Leading Organizational Change — Examine the complex interpersonal and strategic issues involved in successfully spearheading change. Gain frameworks and perspectives on leading change and apply them to your unique business challenges. Leading and Managing People — Engage the principles of human behavior to better influence and lead others. Learn how to avoid your blind spots, examine how your actions affect others, and gain the resources to lead more effectively. NEW Leveraging Neuroscience for Business Impact — Learn how to apply neuroscience principles and technology in your organization to shape and improve marketing, design, management, leadership, team-building, finance, and innovation. Strategic Persuasion Workshop: The Art and Science of Selling Ideas — Assess your personal persuasion style, and apply what you learn to your current challenges. This program provides tools to help you advance your cause in your organization, identify and remove barriers to persuading others, and learn the “Art of Woo” – winning others over. The Leadership Edge: Strategies for the New Leader — Make the transition from new manager to leader in your organization. Gain insights into your decision-making processes and develop an authentic leadership style that is true to your personality. 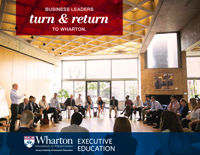 As a leader in finance education, Wharton offers a strong selection of in-depth programs led by distinguished faculty. If you want to strengthen your knowledge of finance and financial management in today’s economy, this is the track to take. NEW Assessing Commercial Real Estate Investments and Markets — Discover how to add commercial real estate to your client’s or institution’s diversified investment portfolio. Become more discerning evaluators of real estate investment partners and opportunities in the U.S. and globally. 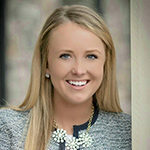 NEW Client Psychology — Develop a more effective client-centered practice by drawing heavily on advances in psychology, behavioral finance, evidence-based decision making and the human sciences to better understand the biases, behaviors, and perceptions that impact client decision-making and financial well-being. NEW Corporate Valuation — Learn how to evaluate the financial implications of strategic business decisions through financial modeling. Become more effective at communicating the consequences of financial decisions to your organization’s key stakeholders. Finance and Accounting for the Non-Financial Manager — Learn how to use financial data to make business decisions and to evaluate your firm’s performance. Examine core concepts of finance and accounting in a straightforward, easy-to-grasp manner. Investment Strategies and Portfolio Management — Develop investment portfolios that generate the highest return for your level of investment risk. This program provides a solid foundation for building optimal portfolios and effective tools for making better investments. Mergers and Acquisitions — Our interdisciplinary faculty and industry speakers help you select, assess, and evaluate potential opportunities. Examine acquisition strategy, valuation techniques, tax issues, due diligence, and post-acquisition integration. Pricing Strategies: Measuring, Capturing, and Retaining Value — Gain new approaches for achieving maximum value and increasing your firm’s bottom line. Learn about the specific challenges facing various industries, including pricing new products, short lifecycle products, dynamic pricing, and bundling products and services. Private Equity: Investing and Creating Value — Gain exposure to the strategies that private equity firms use to structure and finance a deal and create value for their investors. Understand the key drivers in private equity and gain confidence in evaluating investment opportunities. NEW Value Creation and Growth Through Innovative Corporate Finance — Determine when to take on debt, offer equity, or do a combination of both when making capital structure decisions. Examine how valuation models change when making financial decisions. NEW Venture Capital — Learn how to evaluate venture capital investment opportunities and do due diligence that will uncover pitfalls and mitigate risk. 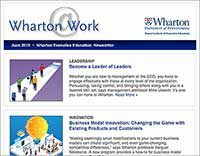 Wharton’s faculty is comprised of some of the world’s best thought leaders, who will teach you how to identify and devise strategies that will successfully lead your company through change. NEW Business Model Innovation in the Digital Age: — Learn how to unlock significant opportunities for adding value and growth by innovating with your existing products, customers, and markets. Implement a process for business model innovation that can be used repeatedly throughout your organization. Corporate Valuation: — Learn how to evaluate the financial implications of strategic business decisions through financial modeling. Become more effective at communicating the consequences of financial decisions to your organization’s key stakeholders. Customer Analytics: — Gain an in-depth understanding of new forms of customer data, advance your ability to forecast customer behavior based on identified data patterns, and acquire the skills to formulate concrete recommendations that leverage your findings to drive successful outcomes. Driving Growth through Strategic Partnerships: — Gain the tools you need to overcome many of the inherent obstacles that occur when expanding into new markets or developing new products. Effective Execution of Organizational Strategy: Identify and understand your own negotiation style and that of others to negotiate more effectively. Learn transformative techniques and acquire practical tools and frameworks that will improve your ability to negotiate both inside and outside your organization. Innovation for Growth: Strategies for Creating Value: — Create new business models, launch new products, improve customer experience, and open new markets. Learn how to design a flexible innovation process that lets your company quickly adapt to, and profit from, changes in customers, competitors, or markets. Global Strategic Leadership — Discover how you can formulate a global strategy for your organization and learn how to execute it with speed and agility. NEW Leveraging Neuroscience for Business Impact: — Learn how to apply neuroscience principles and technology in your organization to shape and improve marketing, design, management, leadership, team-building, finance, and innovation. Mastering Innovation: From Idea to Value Creation: — Become the catalyst for company-wide change when you learn how to construct the architecture that drives innovation in an organization. NEW People Analytics: HR Transformation through Data — Discover how to apply analytical data to make more informed people-related decisions, and acquire better human resources tools for defining and cultivating organizational culture. NEW Scaling Ventures: Developing the Playbook for Profitable Growth — Resolve the key challenges companies face when trying to grow rapidly as they transition from tactical, short-term thinking to a long-term focused vision. Learn how to move beyond the startup phase to create a large enterprise of tremendous value. Strategy and Management for Competitive Advantage: — Learn to accurately assess the competition, design a compelling strategy, leverage your firm’s capabilities to full advantage, and obtain necessary resources through alliances, acquisitions, and internal corporate ventures. The Strategic Decision-Making Mindset: — Explore the best practices and behaviors that lead to good decision-making habits. Learn how to effectively use critical thinking in business and gain a deeper understanding of the role personal judgment and emotions play in the decision-making process. If your professional goals are varied, consider designing your own CPD and customizing your executive education experience to achieve these goals. You can choose a combination of any four programs in our open-enrollment portfolio, from the specialized tracks as well as from our Marketing programs portfolio.